Guidebook to walking in Northumberland. 36 graded walks of 4 to 14 miles, from the beautiful coast with its immense, empty beaches and dramatic, crag-top castles to the remote hills of the Cheviots and Pennines. 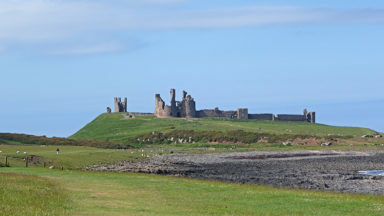 Includes Hadrian's Wall, Lindisfarne Priory, Kielder, Berwick, Bamburgh and Dunstanburgh Castles and more. It's always a great time to walk in Northumberland - each season holds its delights - but walkers need to be prepared for snow in the Cheviots and on the Pennines in winter. Lindisfarne, Craster, Berwick-upon-Tweed, Seahouses, Wooler, Rothbury, Allendale, Haltwhistle, Alwinton, Ingram, Kielder and many other villages. A wide selection of walks including full days on the hills and coast and shorter walks at lower levels. Terrain includes moorland, farmland, forest tracks, coastal paths and woodland trails. Routes range from 6 to 22km. No technical difficulties. The remote Cheviot Hills and impressive Iron Age forts; historic coastal routes, including the lesser-known side of Lindisfarne; Hadrian's Wall; the moors and valleys of the Pennines; Kielder Water and through its sprawling forests. The book comprises 36 short walking routes between 4 and 14 miles in Northumberland, England's most sparsely populated county. Ranging from easy ambles and gentle woodland trails to long days on the hills: there is something for all types of walker - and all types of weather. Taking in the beautiful coast with its immense, empty beaches and dramatic crag-top castles to the remote hills of the Cheviots and Pennines, the whole county is covered. Most of the routes are circular, but there are a few linear walks that make use of local bus services. With such a prolific and knowledgeable guide as Vivienne Crow, you know you can't go far wrong. 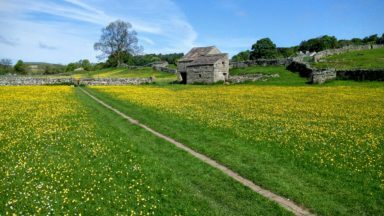 Northumberland has been described as England's Empty Quarter, but there can be few other counties with as much history crammed into every corner. From its glorious castle - crowned coast to Hadrian's Wall snaking across the neck of England, the past is close to the surface wherever you may wander. 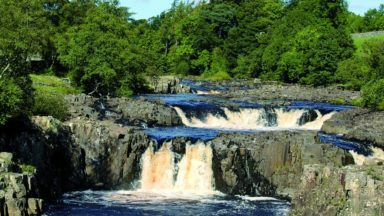 Add to that the wild, rugged landscapes of The Cheviots the Simonside Hills and the desolate north Pennines, Northumberland surely has something for everyone. So this thorough and comprehensive updating and revision of Alan Hall's previous Northumberland title for Cicerone first published in 1998, is especially welcome. And with such a prolific and knowledgeable guide as Vivienne Crow, you know you can't go far wrong. The new guide is up to the usual high standard we expect of her and of her publishers. Clear, Ordnance Survey mapping is matched by the author's crisp and informative prose, making this the ideal companion to walking in the Empty Quarter. The only blot on the Northumberland landscape - the enormous regimented forestry of Kielder - is generously afforded five walks. But only the 12- mile Deadwater and Peel Fell ramble escapes from the ugly scum of forestry surrounding the reservoir to give you a real taste of GM Trevelyan's "land of far horizons." I highly recommend this book. It has a wonderful variety of walks to choose from across all of Northumberland, and all the important information you’ll need on those walks. I was recently sent a copy of the new book ‘Walking in Northumberland’ to review by Cicerone Press. I quite enjoy opportunities like this as it gives me an excuse to go out and test some of the routes, however this one was particularly exciting as I’d never actually been walking in Northumberland before. 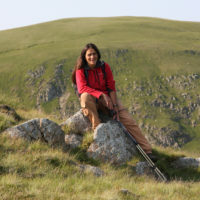 The book is written by Vivienne Crow, an award winning freelance journalist and avid hillwalker. She has now authored over a dozen walking guidebooks. The book is very nicely laid out with plenty of well chosen photographs to show off the highlights of the routes. The guides themselves are well written and easy to read. It’s not just a ‘go here, turn there’ set of instructions. Plenty of useful information is included about the surroundings and places of historical interest. I journeyed up to Northumberland for a couple of days and tested three of the routes from the book: Border Ridge including Windy Gayle, Rothbury Terraces, and Simonside Hills. It turned out to be a quite wonderful two days due to an extremely hot and sunny Bank Holiday weekend, and of course the utterly gorgeous scenery of Northumberland. I may have fallen in love with it a little bit! Along with a map (because you really shouldn’t go wandering off across the moors armed with nothing more than a book! ), I had no trouble at all following the directions for the three walks in question. Points of reference were clearly explained and little snippets of text prompted me to explore a little more when it was appropriate to do so. At the beginning of the book, before the walks start, there are a few mini chapters on subjects such as geology, wildlife, and history. I found these chapters to be very interesting and felt they made a nice addition to the book. The section on wildlife informed me that there was a chance I could encounter an Adder basking on one of the paths – and that’s exactly what happened! It was my first ever sighting so I was very excited about that. The walks are also split into several sections covering different areas. There’s a nice variety to the walks that cover both high and low level walking, hills, forests, coastline, and sections of Hadrian's Wall. Everything is logically laid out and therefore easy to find. All in all, if you’re interested at all about visiting Northumberland to walk, then I highly recommend this book. It has a wonderful variety of walks to choose from across all of Northumberland, and all the important information you’ll need on those walks. Access for dogs, transport options, parking, facilities, etc… It’s all there. A collection of 36 graded walks of between four and 14 miles are featured, ranging from easy rambles and gentle woodland trails to more substantial walks along the coast, in Hadrian's Wall country and among the hills of the Cheviots and Pennines. Most of the walks are circular, while any linear walks make use of local bus services. 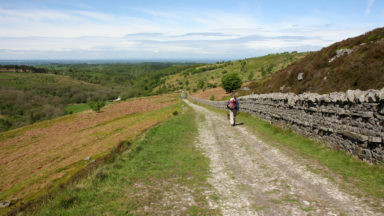 Each walk description contains information about the total ascent involved, approximate walking time, transport options, public toilets and refreshments, and is accompanied by extracts from 1:50,000 Ordnance Survey mapping. Very well written by Vivienne with concise route descriptions and some stunning photographs throughout the 200 pages, this is a walking book to suit all ages and abilities. 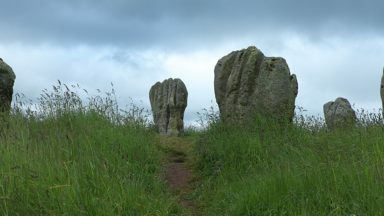 Northumberland is a county of a variety of scenic highlights and this has been well covered in this latest new walking guide by Vivienne Crow. This new book covers the best areas of Northumberland; the stunning coastline with its secluded beaches, the northern part of the county including the Cheviot Hills, Kielder Water and its surrounding forests, the area around Hadrian’s Wall and the North Pennines in the area south of the River Tyne around Blanchland and Allendale. The book contains a total of 36 walks ranging from 4 miles to 13½ miles. In the book the walks are also graded from one to five – easy to strenuous, based not just on distance and ascent but also on the type of terrain encountered on the walk. In a number of previous books by Cicerone one of my minor criticisms was that some of the walks were starting and finishing partway down a page and I am glad to see that in this book each walk starts at the top of a new page. In addition to the walks themselves, the book also contains chapters on Weather, Geology, Wildlife & Habitats, History, Places to stay, Public Transport, Maps, Waymarking and access, Access for Dogs and finally Clothing, Equipment and Safety. I have probably walked over a third of these walks whilst on holidays at Alnwick, Keilder, Gilsland and Haltwistle but that leaves me with probably a further twenty walks in this book still to tackle over the next few years.